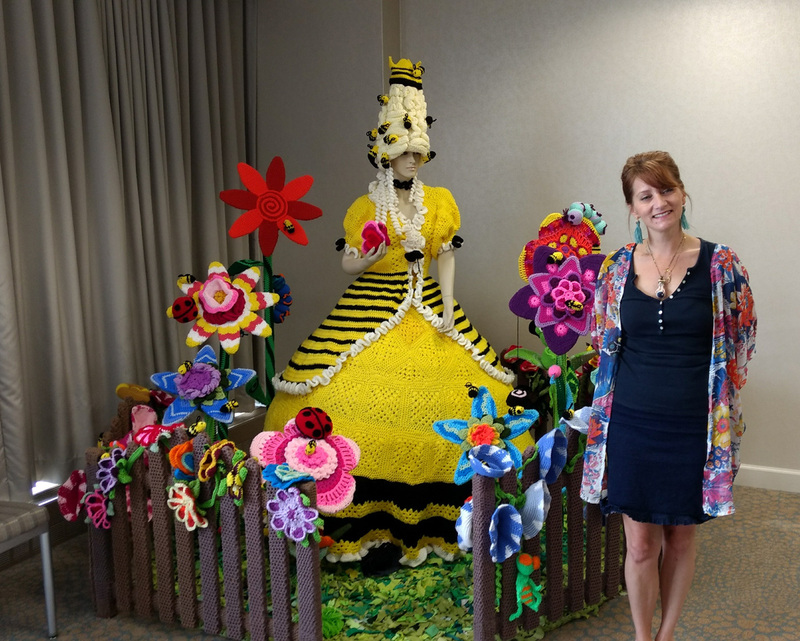 I’ve been back from the CGOA Conference in Chicago for 3 weeks now and I thought I’d share some of the highlights of the conference this year for me! 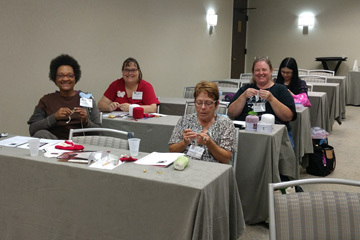 I taught 6 crochet classes this year: Beginning and Intermediate Filet Crochet, Beginning and Intermediate Bruges Lace Crochet and 2 classes of Invisible Repairs. 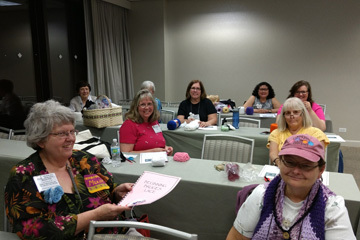 For more information about any of these classes, check out my previous blog post here. 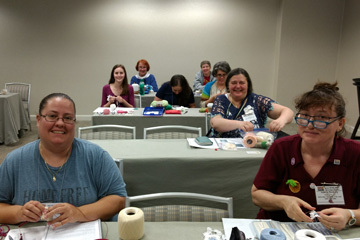 My smallest class had 11 students and my largest class was sold out at 25 students! I had the best students in each of my classes this year! 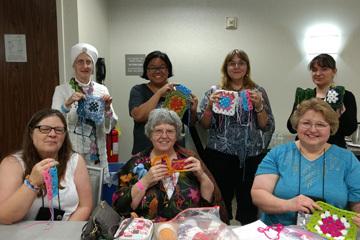 I met so many nice, encouraging, friendly crocheters in every class and at every event!!! My dog had run into my left foot the Saturday before the conference, giving me a huge bruise and a very tender foot, so I was hobbling around a lot before and during the conference. 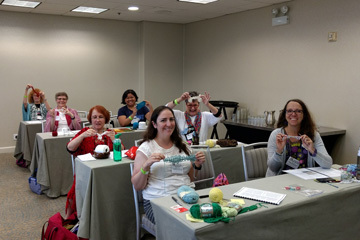 My students were very understanding and let me sit down a lot, bringing their crochet pieces and questions to me most of the time! 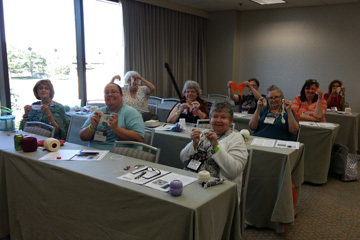 I thoroughly enjoyed meeting each student and sharing my crochet knowledge with them!!! 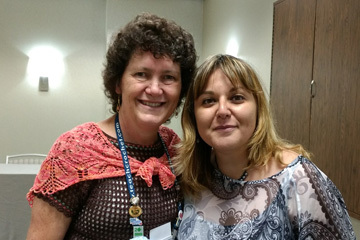 Corina is from Romania. 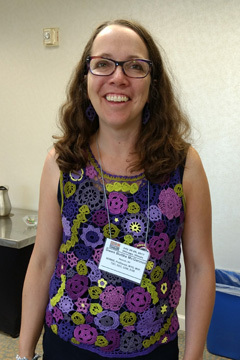 She had contacted me through Ravelry a week before the conference asking a question about one of my designs. I noticed that she lived locally to Chicago and told her about the conference. I had no idea that she would actually attend the conference, let alone take one of my classes! And it was her birthday, too! Happy belated birthday, Corina! 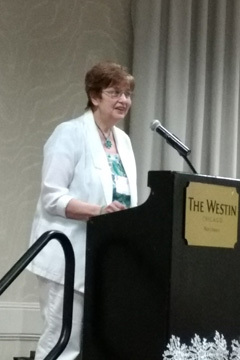 I hope to see all of my students at next year’s CGOA Conference to be held in Portland, Oregon from July 25-28, 2018. 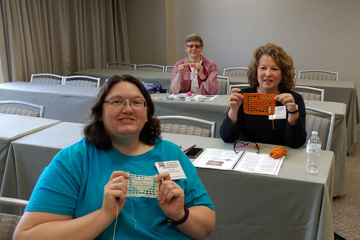 Another fun event at the conference, besides classes, is the Design Competition. 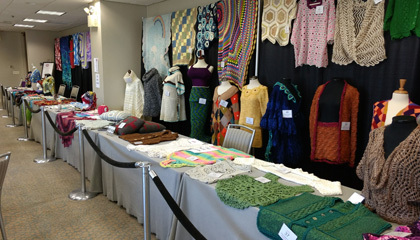 I entered a shawl that I designed this year and I won an Honorable Mention! 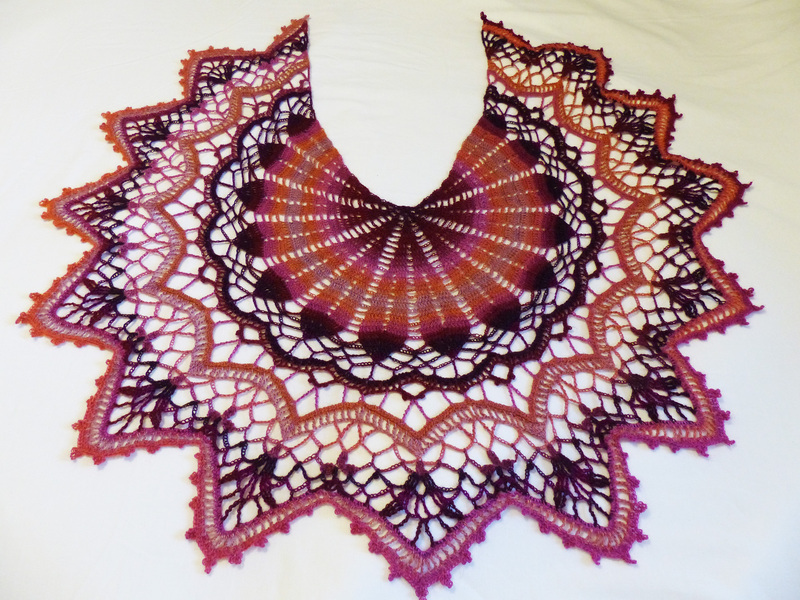 Here’s the shawl, which I’ve named Blazing Embers Lace Shawl. 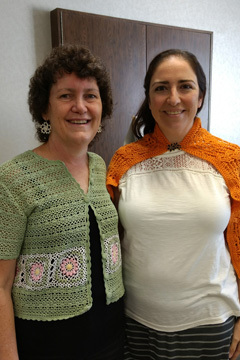 I designed it based upon a really pretty doily that I crocheted a number of years ago. 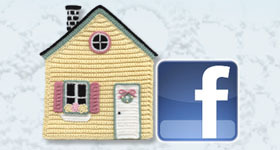 Obviously this isn’t a doily! I’m pleased with how it turned out and will self-publish the pattern one of these days/weeks/months/years, when I get the chance!!! 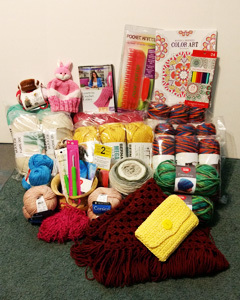 And here’s the loot from the goody bag that I came home with this year! What a haul!!! If you’ve never been to a CGOA Conference, I hope you’ll take the plunge and attend one (or more)! 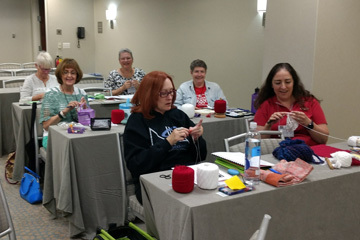 You’ll learn so much, meet awesome crocheters and make life-long friends! 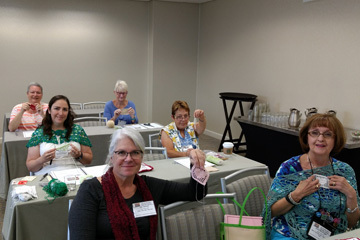 This entry was posted in Bruges Lace Crochet, CGOA, Crochet classes, Crochet repairs, Design Contest, Filet Crochet, Teaching classes, teaching crochet, Thread crochet, travel and tagged Bruges Lace, CGOA, classes, conference, crochet class, crochet repairs, filet crochet, teaching. Bookmark the permalink.